Follow the signs for Stockport and Manchester Airport and hence blend into the M60 (West/South). 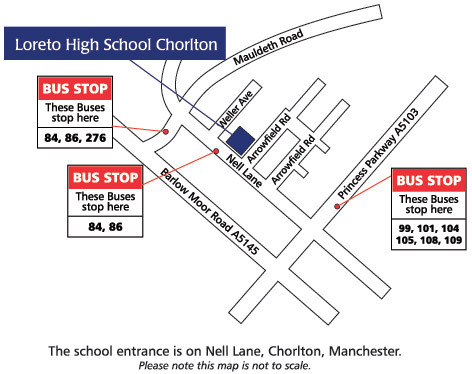 Leave the M60 at Junction 5, following the sign for the A5103 and Manchester. Proceed along the A5013 and take the left turn immediately after the Southern Cemetery and immediately before Rodgers the Florists. The school is on your right immediately beyond Arrowfield Road. From the M6 join the M56 (signpost Stockport) at Junction 20. Proceed directly into South Manchester, eventually the M56 merges into the Princess Parkway (A5103). Please select the bus service number to download the latest routes and timetable information. Click here or the image above to download the Metrolink services map.